Caption slip reads: "Photographer: Wesselmann. Date: 1953-02-14. Reporter: McMillan. Assignment: FBI agent shoots wrong man at Shaw Motel at 11112 Long Beach Boulevard. 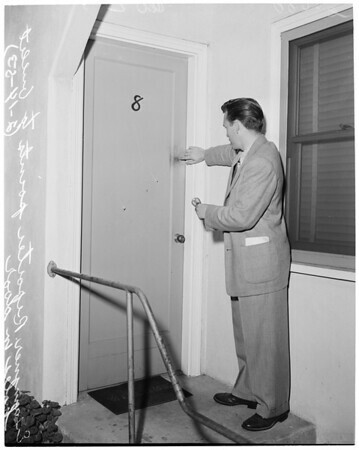 2: Examiner reporter points to bullet holes in door."